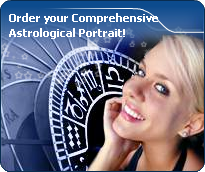 You will find on these pages the celebrity horoscopes having the Moon in the 12 houses with an interactive chart and excerpts of astrological portrait. The Moon is complementary to the Sun in the sense that she represents the feminine part of the personality (the Yin), the unconscious, the emotions and the sensitivity of the chart's owner. She symbolizes all feminine figures such as the mother, the wife, etc. She is a sign of fertility, femininity, imagination and memory, or lack of, depending on the aspects she receives. She is particularly important in a woman's chart because she is believed to express more or less easily her female status and her femininity. In a man's chart, although the Moon represents his sensitivity, she may be of a lesser importance, since she is often repressed. In addition, she symbolizes the chart owner's mother, and later on, his wife as well as his representation of the ideal woman. The Moon is the night star. Therefore, she is associated with dreams, the unconscious, subjectivity, moods, the past, nostalgia, but also with laziness, nonchalance and whims. Besides, she is of utmost importance for children, because they have not yet learnt to master their primary instincts, and remain very attached to their mother.